Methods in Geochemistry and Geophysics, 2: Paleotemperature Analysis focuses on the paleotemperature-analytical method, including the use of oxygen isotopes in carbonate analysis and in advancing knowledge on paleoclimates. The manuscript first offers information on the isotopes of oxygen as climatic indicators and sampling of fossil organisms, as well as oxygen and paleotemperatures, belemnoidea, and other fossils. The book also ponders on chemical techniques and mass spectrometric methods. Discussions focus on thermal and acid decomposition of carbonates, slow formation of carbonate solids, precipitation of carbonate, and mass spectrometry. The text examines paleotemperature scales and magnesium and strontium concentrations. Topics include salinity, standards, magnesium and strontium contents, history of sea water, and Mccrea's carbonate paleotemperature scale. The publication also takes a look at paleozoic, Jurassic, cretaceous, and tertiary and Pleistocene paleotemperatures. 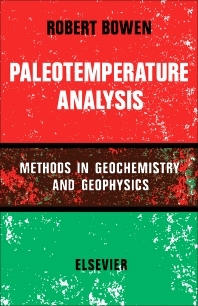 The publication is a dependable reference for readers interested in paleotemperatures.